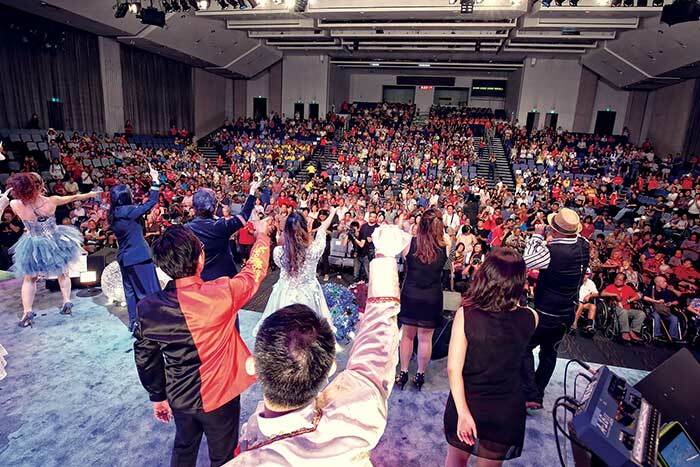 The CHC Dialect Service saw its largest-ever turnout at its recent Oldies Concert—abundantly above what pastor Maria Tok imagined. The Oldies Concert was filled with singing, dancing, colorful costumes and props. Maria Tok delivered an encouraging message. 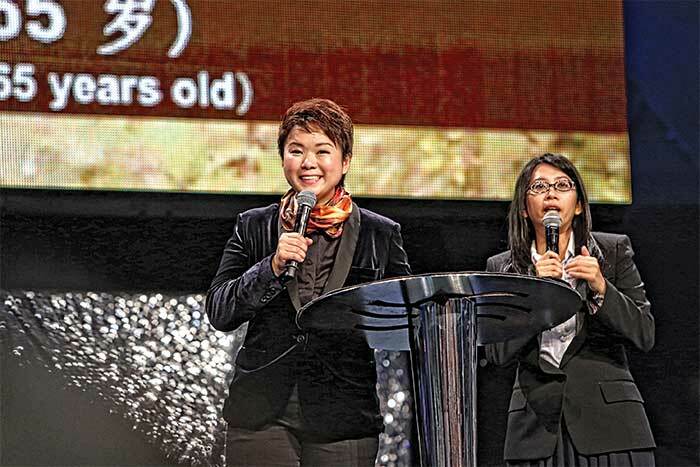 City Harvest Church’s Dialect Service is a marvel to behold. Each week, hundreds of dialect-speaking individuals—mostly elderly persons—gather to worship God in Hokkien and Cantonese, and to hear the Word of God preached by an animated Maria Tok, the pastor in charge of the service. 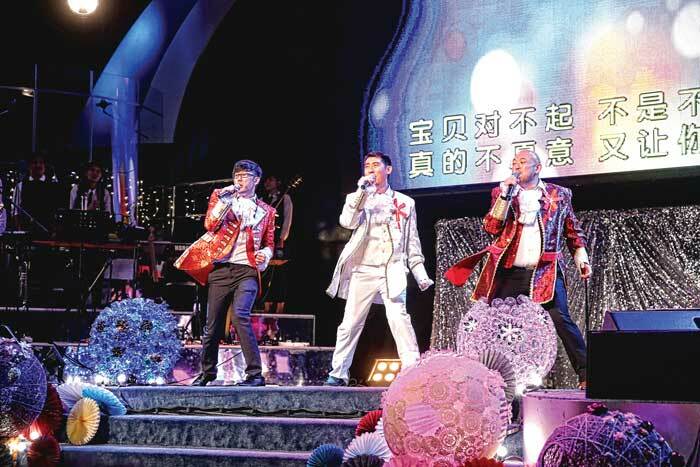 Once a year, Dialect Service conducts its main outreach event, a big blowout concert featuring dancers and singers who perform classic songs in Mandarin and various dialects, dressed to the nines. Oldies Concert has become something of an institution, an annual treat that both audience and volunteers look forward to. Rehearsals for the ninth Oldies Concert began three months before the actual performance, which happened at the church’s Jurong West auditorium on Sep 10. “What’s most impressive is that all the participants putting together the concert were volunteers,” said Mervyn Lim, the CityWorship staffer who oversees the Dialect Service music team. Indeed, Dialect Service only has a staff of three. Its weekly services are run by volunteers. This year’s Oldies Concert saw seven dancers, 14 singers, 14 band members, and eight makeup artists putting the show together. “I’ve been serving in Dialect Service as a musician for five years now,” says Mike Ye, the guitarist of the band. “To me, it’s my calling from God to lead people to the holy place with praise and worship. Bassist Colin Chee started serving in Dialect Service because he knew that God would touch the hearts of many through the stories behind each song. The crew, though working with a tight budget, lacked no imagination. Two stage designers turned hundreds of empty plastic bottles into beautiful “lamps” with the use of light bulbs. These played a part in Tok’s message that day. “Psalm 27:1 says, ‘The Lord is my light and my salvation; Whom shall I fear? The Lord is the strength of my life; Of whom shall I be afraid’. I want these pieces to remind the seniors that even though they feel useless, when they have Jesus on the inside, He will bring light into their world,” said Tok, her point enhanced by the “lamps”. The most important aspect of the preparation work was the outreach. Dialect Service volunteers knocked on doors in estates like Dakota to invite dialect-speaking elderly people to the concert. “They weren’t so interested in our flyer, but when I showed them the trailer that we did, that got them interested,” said Emily Loo, a pastoral supervisor in Dialect Service. The trailer was a short promotional video put together by a team led by Lucas Chia, a creative production associate with City Harvest Church. Upon hearing what Tok had in mind, Chia quickly pulled together Mark Kwan, the church’s creative director and Melvin Lee, a media editor to produce a charming short video featuring two Dialect Service singers as a loving elderly couple who planned a date to the Oldies’ Concert. The video, which was shared via social media and played at CHC’s services, was instrumental in drawing many to the concert. All things work together for good to those who love God—a verse that came to pass when a volunteer was blessed with a $25,000 commission and decided to use it to sponsor a buffet for all the concert goers! The fruit of all the labor of the staff and volunteers was great: 1,334 people came for the concert and 74 of them gave their hearts to Jesus—a groundbreaking number for Dialect Service. Early this year, pastor of Dialect Service, Maria Tok was feeling discouraged. Despite all the hard work of her team and volunteers, the service had not seen a breakthrough in attendance for a long time. Then she read the story of Elizabeth and Zechariah in Luke 1 while preparing for devotion for her staff. Zechariah the priest and his wife Elizabeth were “both righteous before God, walking in all the commandments and ordinances of the Lord blameless. But they had no child, because Elizabeth was barren”. Tok realized that Elizabeth’s barrenness was not a punishment from God. The Bible called them “righteous”; God had a bigger plan for the couple: when Zechariah’s lot fell to burn incense (a rare opportunity) an angel told him that Elizabeth would be pregnant with a baby and they were to call the baby John. Likewise, Tok believed that God had a bigger plan for Dialect Service. She held on to Luke 1:25, where Elizabeth said, “Thus the Lord has dealt with me, in the days when He looked on me, to take away my reproach among people.” God, said Tok, is the ultimate promise keeper. With that in mind, Tok went knocking on the doors of the elderly with her volunteers, believing for 1,000 seniors for her annual evangelistic meeting, the Oldies Concert. In one night, they knocked on almost 900 doors. Still, Tok doubted that more than 900 would turn up on the actual day. “But who agrees with me that doubting God is a dumb thing to do?” she said with a smile. 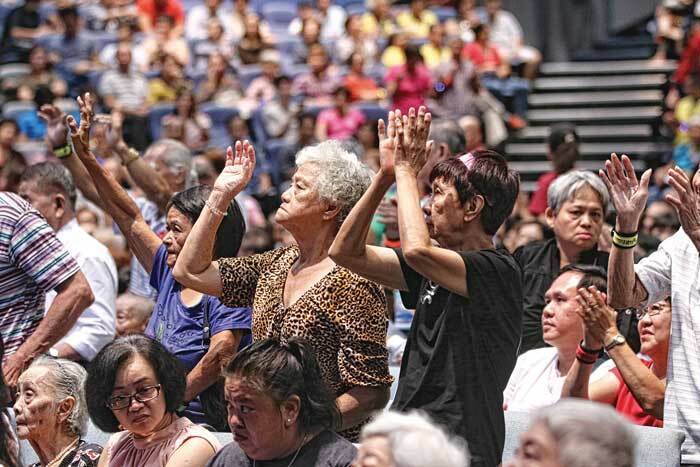 On the day of the concert, the buses which were sent to bring the people to Jurong West were filled to overflowing and volunteers had to bring seniors to church in taxis—Dialect Service saw its biggest ever attendance that day: 1,336.